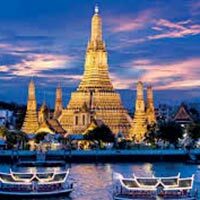 Bangkok- The ‘City Of Angels’, greets the tourists with scenic beauty and the wondrous temples. 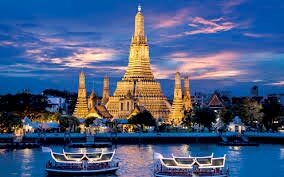 Bangkok Tours Packages treats the tourist with the grandest shopping experience in one of the Asia’s largest shopping centers. Apart from this, Bangkok Tours also treats the taste buds with some pungent delicacies of Thailand. The Safari Tour with Marine Tour is a must-stop destination.Expenses Of Any Personal Nature (Phone Calls, Laundry Etc). Transfer from Bangkok International airport to Pattaya Hotel (SIC TRANSFER). Half Day Coral Island with Glass Bottom Boat Ride & Indian Lunch in Pattaya (SIC TRANSFER). Alcazar Show Pattaya (SIC TRANSFER). Transfer from hotel in Pattaya to hotel in Bangkok with Lunch. (SHARED VAN / SIC TRANSFER. Half Day Bangkok City Tour(SIC TRANSFER). Transfer from Bangkok Hotel to Bangkok International Airport. (SHARED VAN / SIC TRANSFER). •The Above Rates Are Based On Minimum 2 Persons Traveling Together And Are Applicable For Indian Passport Holders. •The Above Prices Are Calculated Based On The Lowest Available Airfare And Current Applicable Taxes, And Are Subject To Avaliability And Change At The Time Of Booking. •Rates Are Subject To Change In Any Case Of Any Changes In Hotel Taxes, Roe, Transport Rates, Government Taxes & Entrance Fees. •Rates Are Based On Current Roe And Roe Will Be Applicable At The Time Confirmation Hotels Subject To Availability At The Time Of Making Reservation. •In Case Of Unavailability In Mentioned Hotels, Alternate Accommodation Will Be Arranged In A Similar Category Hotel. •International Check In Time Is 1400 - 1500 Hours; Check Out Time Is 1100 - 1200 Hours. Early Check In / Late Checks Out Is Subject To Availability Of Rooms. •Tour Package Rates Are Not Applicable During Trade Fairs, Exhibitions And Conventions. Additional Surcharges Applicable For The Same. •No Amendments Possible Once Land Arrangements Have Been Confirmed. •No Refund For Partly Unutilized Tickets. No Refund For "No - Shows"
•Granting Or Rejecting Visas And Immigration Clearance Is The Sole Prerogative Of The Concerned Sovereign Governments And We At Travelguru Can Only Facilitate In The Entire Process. 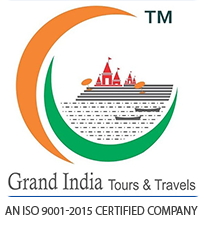 We At Travelguru Shall Neither Be Responsible In Case Of Non-Granting Of Such Documents. Even If The Visas Are Rejected, Cancellation Charges / Fees Shall Be Payable By The Client. There Will Be No Refund, If The Clients, Or Any Member Of His Party, Is Unable To Travel Due To The Said Reasons.